Tapestry is a form of textile art, traditionally woven on a vertical loom, however it can also be woven on a floor loom as well. 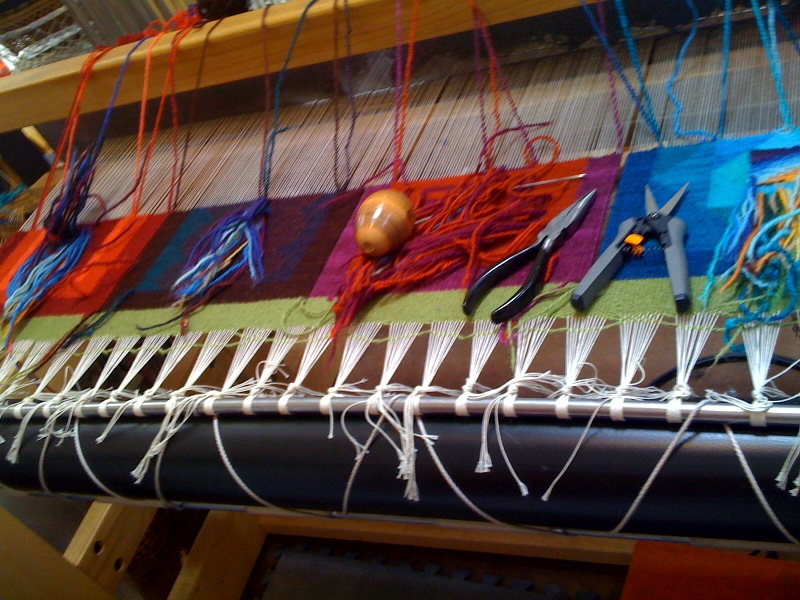 It is composed of two sets of interlaced threads, those running parallel to the length (called the warp) and those parallel to the width (called the weft); the warp threads are set up under tension on a loom, and the weft thread is passed back and forth across part or all of the warps. Tapestry is weft-faced weaving, in which all the warp threads are hidden in the completed work, unlike cloth weaving where both the warp and the weft threads may be visible. In tapestry weaving, weft yarns are typically discontinuous; the artisan interlaces each coloured weft back and forth in its own small pattern area. It is a plain weft-faced weave having weft threads of different colours worked over portions of the warp to form the design. Tapestries in progress. The "tails" of yarn that are hanging out are the "Discontinuous Wefts" The white strings are made of a sturdy cotton and are the warps, which serves as the underlying structure for the wefts which create the designs.